If you are fed up with the current state of your old fashioned bathroom with its deteriorating suite, cracked tiles and failing flooring, you will more than likely to be looking to make a change in order to give yourself a space that you can be proud of once more. Instead of going for a traditional bathroom set-up, why not consider something a little different and very modern in the form of a wet room? The first question you may be asking yourself is what exactly a wet room is as you may have seen them on the TV previously but never quite understood what one is. In essence, a wet room is an open, waterproofed area that can be as small or spacious as you desire. They usually have an open plan shower with no tray, a toilet and basin, and sometimes a bath. Unlike normal bathrooms there are no enclosures and the space is usually open plan. If you are looking to add a touch of luxurious style to your property, you won’t go far wrong with a wet room. Wet rooms are also attractive to those with disabilties or those that are unwilling or unable to use a bath which can be a great attraction to potential buyers of your home. The high end design of these rooms can add to the potential re-sale value of your property as buyers associate this stylish type of room with the top end hotels on the market! In a wetroom, you have the freedom to choose a larger tile, and this adds the advantage that less grout makes for easier cleaning. For the floor stay away from highly polished tiles and choose something with a small amount of texture to add an element of slip resistance. How Do I Create a Wet Room? The most important thing when designing a wet room is ensuring the space is waterproof, therefore tiles are the best choice for both the walls and floors, however one thing that lots of sites won't tell you is that its very important to waterproof the area BEFORE you tile. The reason for this a common misunderstanding; waterproof grout doesn't actually stop water passing through it! it just doesn't fall apart when it gets wet. This is a fact that lots of people aren't aware of, and its the same for EVERY brand. The simple fact is that grout isn't supposed to stop water ingress, its up to you to make sure that the substrate is right for a wetroom. This means that any surface that falls apart when it gets damp is out; plasterboard and chipboard are a great way to achieve leaks and failures. 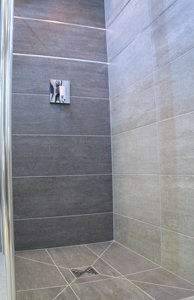 You're wetroom walls should be either render or ideally backerboards such as no more ply, or if they are already plastered use a tile tanking product to fully waterproof them. 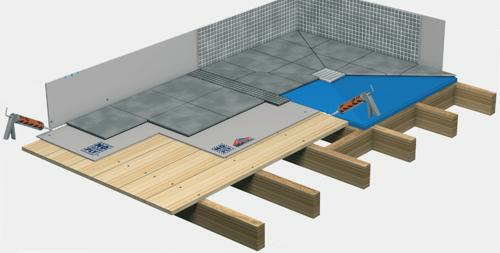 Floors should be concrete or overboarded with no more ply. The next thing to tackle is your shower tray, or rather the lack of one! kits like the Kascade wetroom system allow you to fit a preformed 'tray' which you embed into your floor, then tile over the top of. Using this system means that the correct angles are applied to allow water to drain properly and tiling becomes very easy. Follow these tips and you'll have a long lasting wetroom thats easy to clean (just mop\hose it!) and really adds a stunning feature to your home. 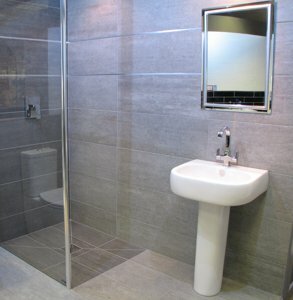 Here at Trade Price Tiles we have a number of different tile choices that are perfect to be used within a wet room, ensuring the space is first and foremost waterproof whilst looking great at the same time. If you are looking for something a little different from the conventional bathroom space, hopefully this post has given you a clearer idea on the benefits of a wet room and answered some of the questions you may have had. Should you decide that this choice is the one for you and your home, be sure to come to us here at Trade Price Tiles for the best selection of floor and wall tiles to suit your needs.